This is a rarity in online dating sites. This is actually a free website. You need to register your information and upload pictures but it does not require payment and it gives full functionality from the start. The website has some nice explanatory narratives about dating and how to flirt and explains quite clearly that the site is not an adult dating site but designed for hot young singles and single men to meet others for a date and maybe find their perfect match online. To register a profile you need to complete quite a bit of personal information and also choose the characteristics of your perfect match. However you can opt in or out of most of the data entered, depending how important it is to you. If you are looking for an online boyfriend or online girlfriend in South Africa this would appear to be a great place to start looking and is definitely one of the best dating sites around. Probably because it is a free dating site, it has a lot of members and a nice touch is the ability to blog about your experiences and read other blogs on line. This makes the website feel much younger and fresher than its contemporaries who use online diaries. It is also nice to see some guidance on first date protocols to give some help to guys and girls meeting for the first time. 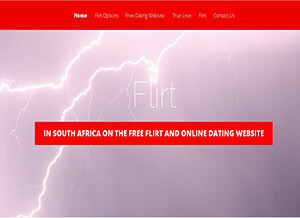 The very simple and non imposing design of the website is easy on the eyes, Dominated by the white background with black text, typical of any standard document, there are a few reds and pinks highlighted in graphics to ensure you know people on this site are searching for love through online personals. You can use the match finder on the website to suggest matches for you and you are able to search or browse as well. You can send online messages back and for and even make your mobile phone details available for texting. However, there are no chat rooms or video camera functions. Ease of use: A very easy site to navigate without any difficulty. Most information is clearly displayed and the registration, although a bit lengthy, is easy to do with drop downs and tick boxes in abundance. Selection of profiles: There is no indication of the exact number of profiles but it would appear to be plentiful. A few searches returned several pages of potential love matches and the fact that nobody can create a profile without a photograph goes a long way to make all profiles easy to read with clear pictures. Star rating: 4/5. An excellent site that is free to use and provides all the functionality you could want. A nice selection of profiles and comfortable reading and design make this a pretty full package. The one concern is the lack of contact information and only a web based form is available should the need arise to get in touch with the company running the site. No physical address or other communications quoted anywhere.